Happy Thursday Sweet 'n Sassy Friends! 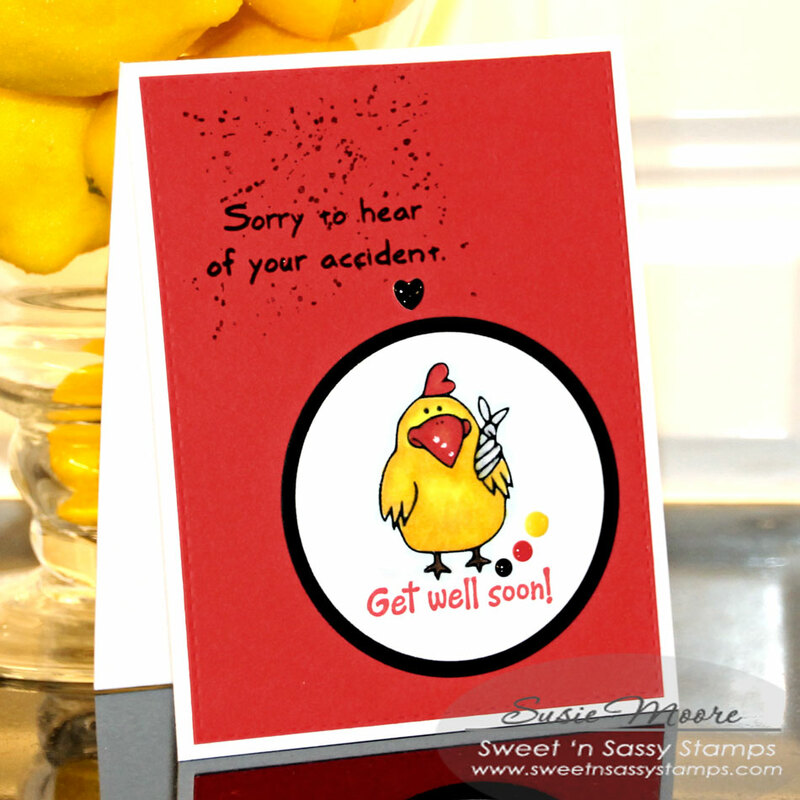 It's Susie here to share a card using the Get Well Critters clear stamp set. 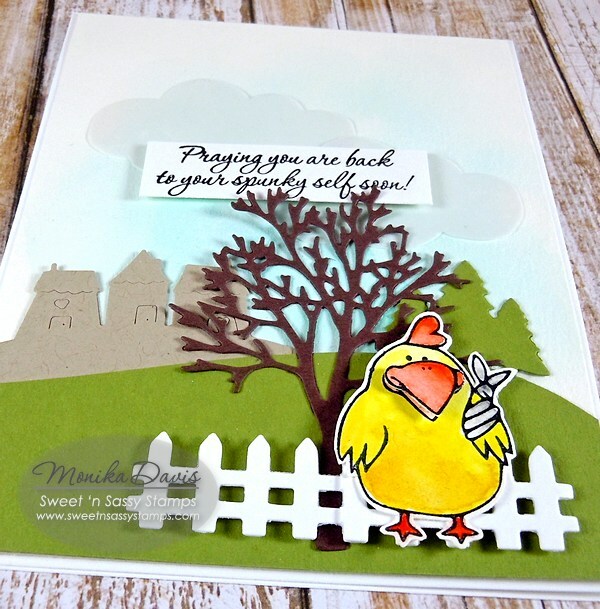 I colored the poor broken-armed chicken with Copic markers and then added my sentiment and a few enamel dots. I added a black mat to my circle and then adhered it to my card. I added an additional sentiment and some splatters to finish my card. 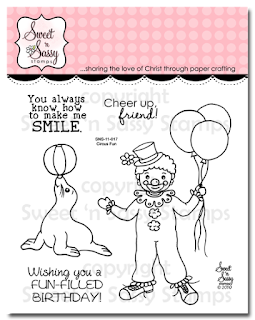 Here is a look at the stamp set I used. There are so many adorable images. It was hard to choose just one! Hello Sweet 'n Sassy friends! 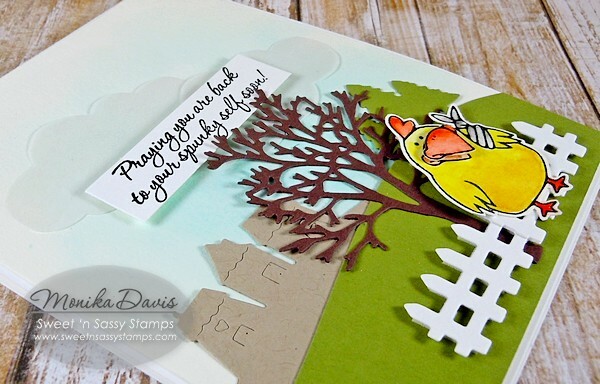 Cathy here sharing a cute thank you card made with the new Winnie's Garden stamp set. 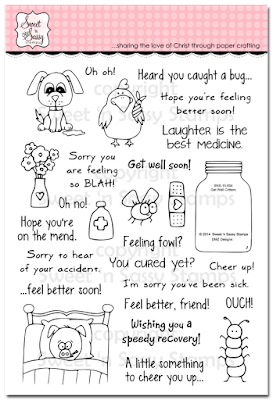 This stamp set is full of cute images and sentiments making it very versatile and ideal for many different occasions as well as for just sending a quick note to a friend! The flower image from Winnie's Garden was white embossed randomly on the background panel and pigment powders were sprinkled on and spritzed with water. Excess water was dabbed off with a paper towel and the panel was dried with a heat tool. Color Burst pigments were sprinkled through a stencil, spritzed with water, and dried to create the circle panel. 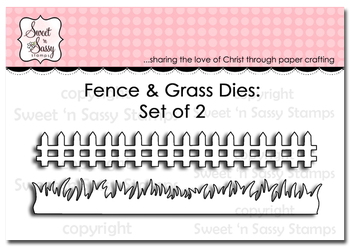 The grass was die cut using the Grass Border after the Color Burst powders were dried. Mixed Media card stock was used for the Color Burst panels, but water color paper would also work for these techniques. 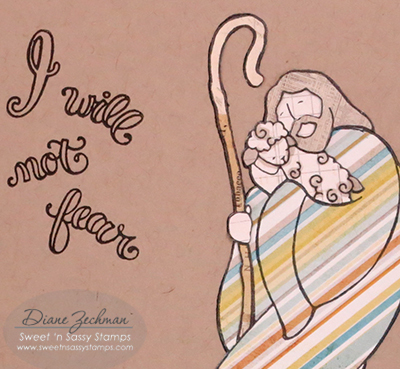 Winnie was colored with Copics, fussy cut, and popped onto the vellum sentiment panel. Wink of Stella was added to the butterfly which was added to complete the Splitcoaststampers Sketch. Winnie's garden is much prettier than mine! LOL! Good morning! 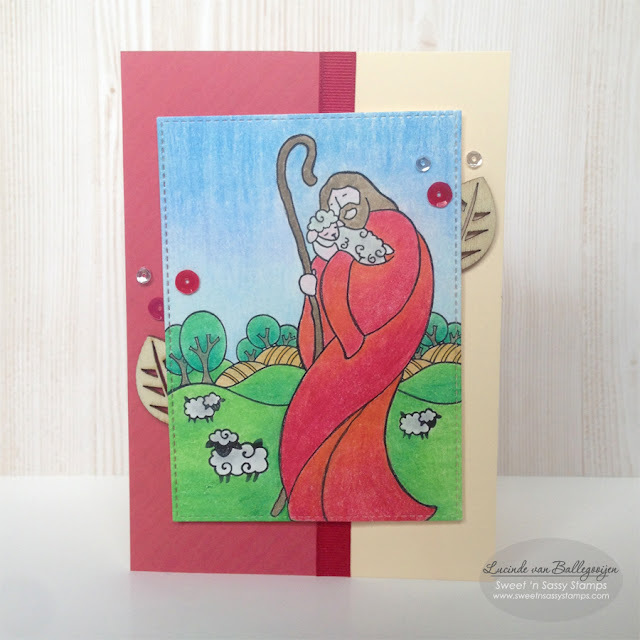 Today I am sharing this card using one of the new bible journaling sets this month called Good Shepherd. 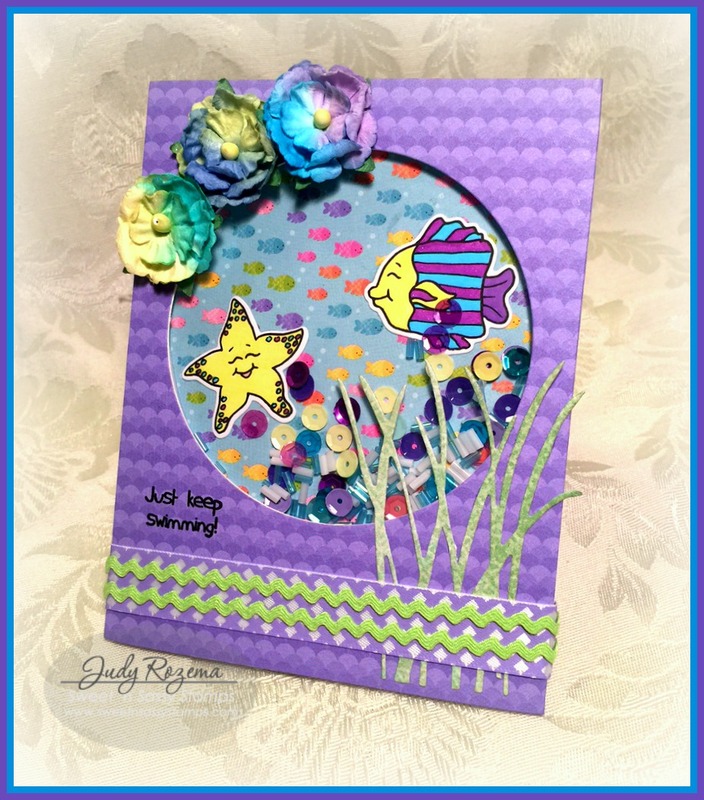 This one was made with Happy Ocean Friends and the Tall Grass Die. I colored them with Copic markers and then glued them to the background paper. Remember to get rid of ANY remaining dried glue (note to self!). I like how the ric rac looks like waves. The multi-colored Prima flowers fit in with the color scheme exactly. I forgot all about a sentiment, and was really hoping that I could stamp it cleanly after the entire card was put together. Last night my sister (who is visiting from Arizona) and I went to see Finding Dory (AWESOME! ), so I knew just what sentiment I would choose. Hello! 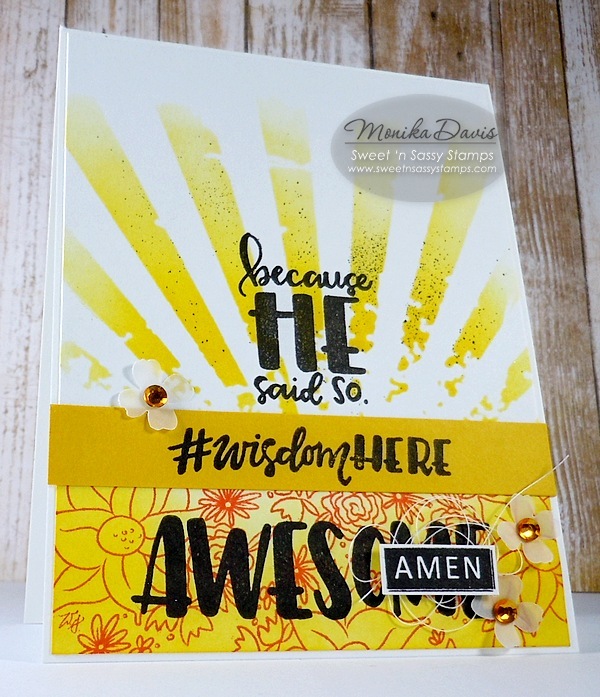 It's Monika here today with an inspirational card, using Awesome Thoughts clear stamp set. I wanted something bright and summery, hence the yellow/orange hues. I stamped the flower cluster image from Winnie's Garden clear stamp set on the bottom part with orange ink, then sponged it with yellow ink. The sun rays were sponged with a Tim Holtz stencil, then spritzed lightly with a Spritzer Tool and black marker. To 'dress up' the card a little, I just added some vellum flowers and thread. Hello Sweet Friends! 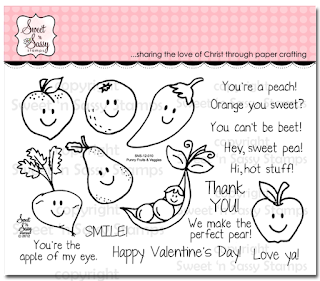 Julie, here to share a card that I designed using Winnie’sGarden, a clear stamp set designed by Wynne Gettelfinger from the current Sweet 'n Sassy Stamp release. 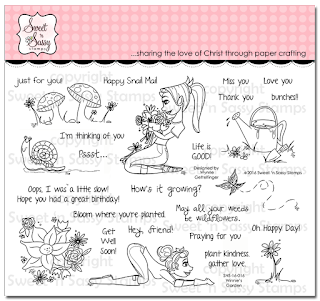 Winnie's Garden is a 26 pc stamp set with eight line art images and eighteen sentiments- an encouraging stamp set for so many different occasions! 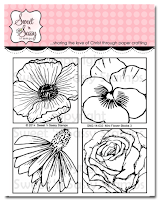 This card was fairly easy to create- stamp the Winnie’s Garden girl with flowers image with archival black ink onto watercolor paper and color her with water-based markers. Ink and stamp the sentiment in the same manner as above and repeat the “landscape” in the background, die-cut a few layers and create a bit of texture with embossing folders to finish off this fun card. 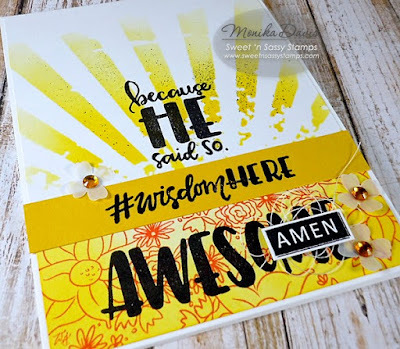 Happy Saturday Sweet 'n Sassy friends, its Ceal here to share a CAS card with you using the Fill Me Up set from our Creative Worship line. 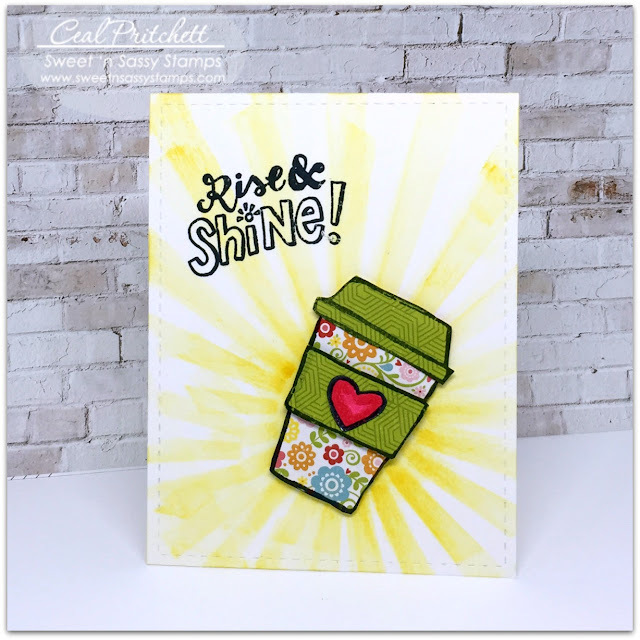 I made this card for the Coffee Loving Cardmakers summer blog hop. I don't drink coffee but I love to participate in these quarterly hops and I love to use coffee related images. This set Fill Me Up, designed by Rebeca Rios is super cute and fun. I paper pieced the cup and made the background using a sunburst stencil to go with the sentiment. I pray that we all rise and shine for Jesus everyday! Hello everyone! Lucinde here. 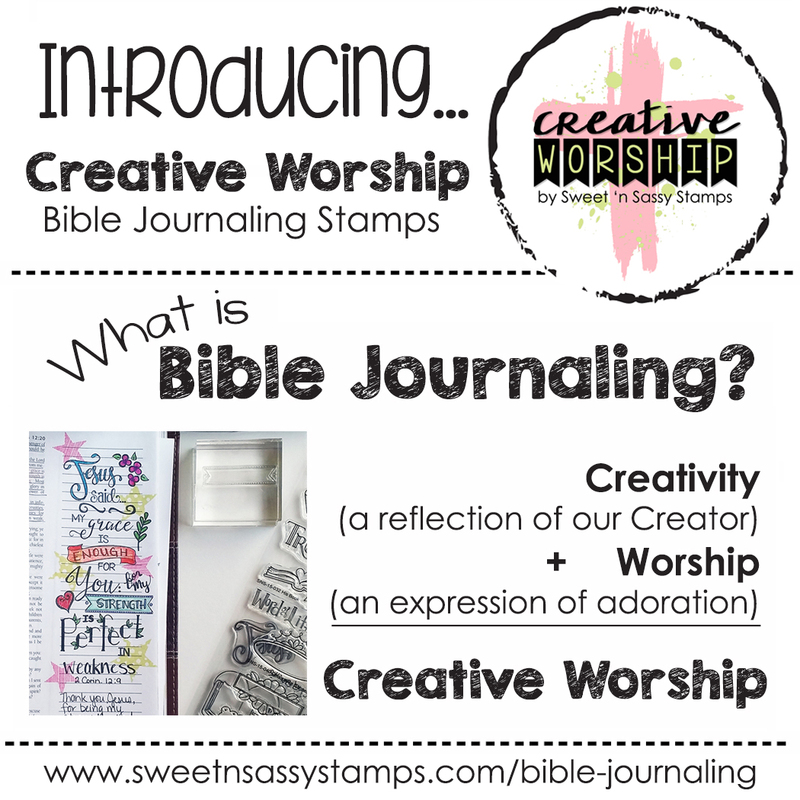 It's my first time sharing a card on this blog, but you might know me from my blogs at Creative Worship. Today I want to show you a card that's made with one of the Creative Worship stamps sets. 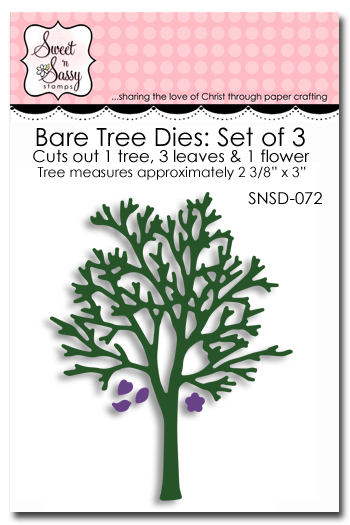 Eventhough they're made for bible journaling, that doesn't mean you can't use them for cards! I think I might use some sets more often for cards than for journaling ;). 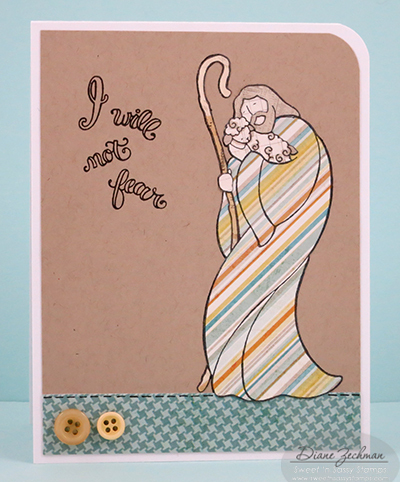 For this card I stamped a little scene with the stamps from 'Good Shepherd'. I love the little sheeps! 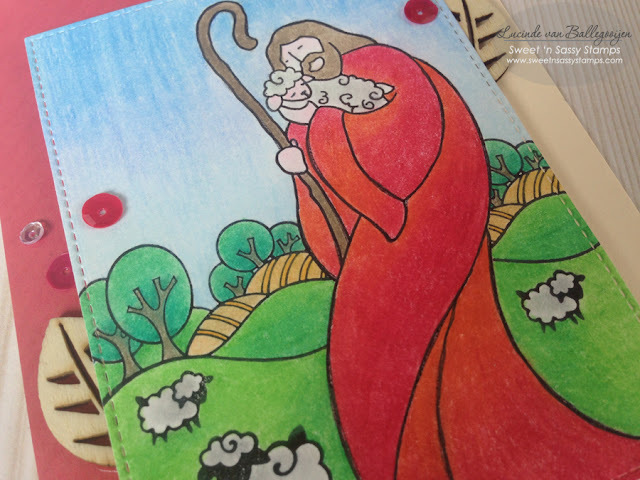 I stamped the shepherd first and masked him to stamp the hills in the background. I colored the images with colored pencils and diecut the frame around the scene. After that all I had to do is adhering everything onto my card. I hope I could inspire you to create today! And don't forget to take a look at the new stamp sets from this month, they're amazing! 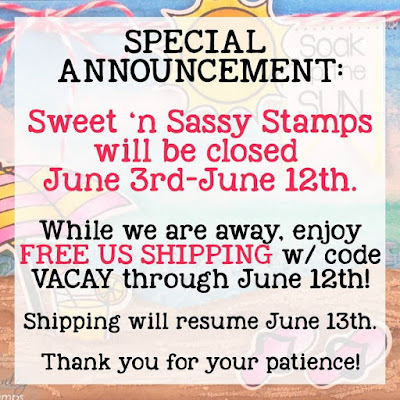 Hello Sweet 'n Sassy friends! Cathy here with two very different cards to share with you today. 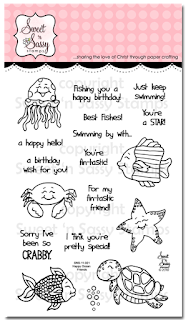 I have a great niece who is three so I like to keep fun cards on hand for special occasions. There are so many cute stamp sets at the SNSS Store that are perfect for this, but for her next fun-filled birthday, I just had to use this adorable clown from the Circus Fun stamp set. 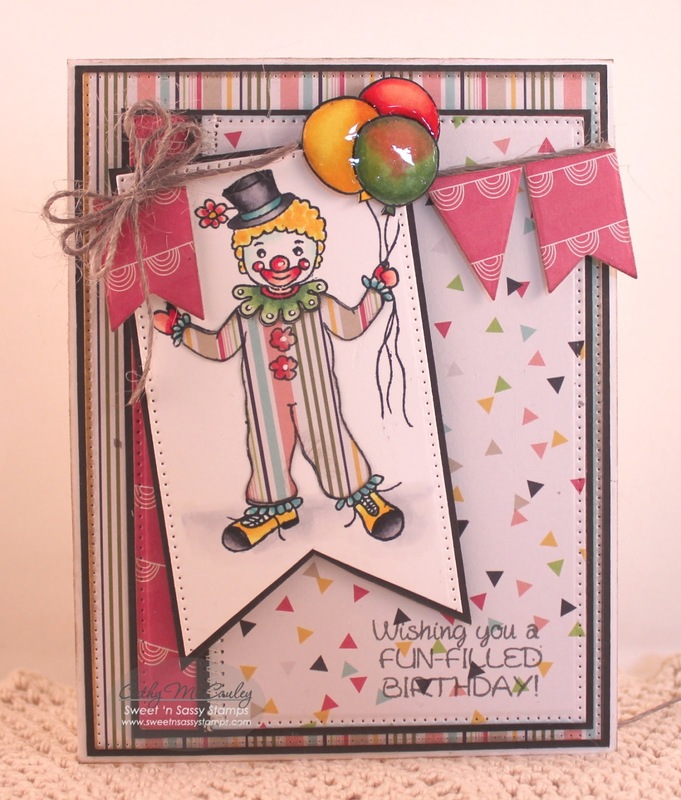 Fun papers by American Crafts provided the ideal background for the clown which was paper pieced and colored with Copic Markers. The balloons were colored and given a coat of Glossy Accents to look translucent. Banner Dies were used to create the banner across the top of the card which was mounted to twine and attached with foam tape. 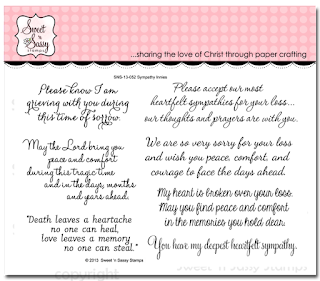 I also needed to wish friends at church the love, peace, and comfort of the Lord after the loss of their mother/MIL. Precious Poppies and a technique learned at a recent Clear & Sheer Online Class were used for my sympathy card. The poppies were white embossed on a piece of vellum dyed with Memento dye inks. 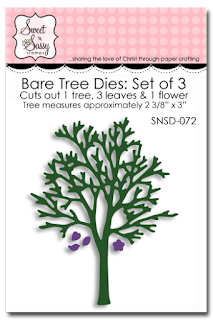 The vellum was attached to card stock that was embossed using the Anna Griffin Poppies folder and mounted to a card base. 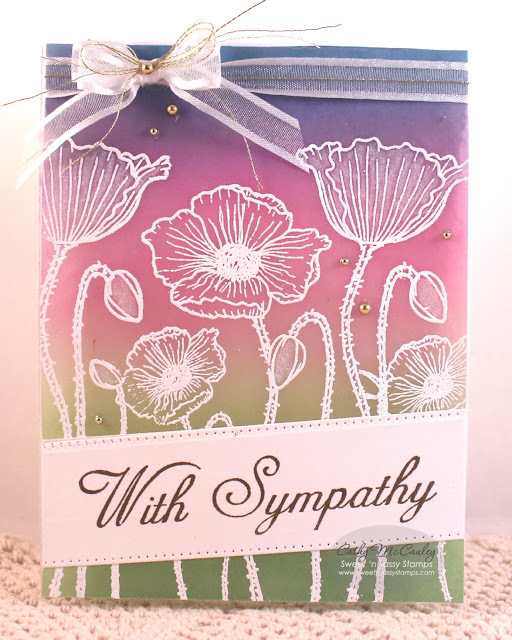 The sympathy greeting from the Script Sentiments stamp set was gold embossed on a strip of white card stock and attached to the card. 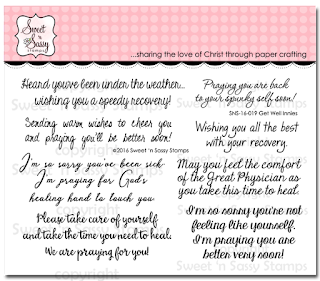 A bow and gold pearls were added to finish the card. A sentiment from Sympathy Innies was gold embossed on the inside. 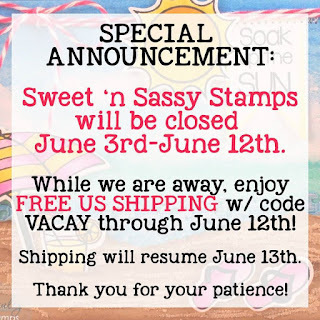 Sweet 'n Sassy Stamp Store. Good morning Sweet 'n Sassy friends! Today I am sharing a card using the Happy Together stamp set along with a new set this month called Awesome Thoughts. 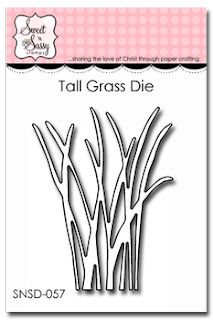 My base card was cut narrower than a normal A2 size...it is only 3 1/2" wide. 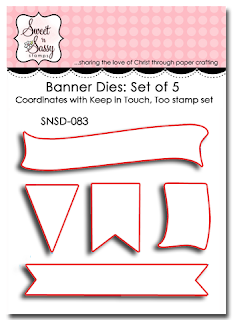 This allowed me to let my banner hang over the edge and the card still fits into an A2 envelope. 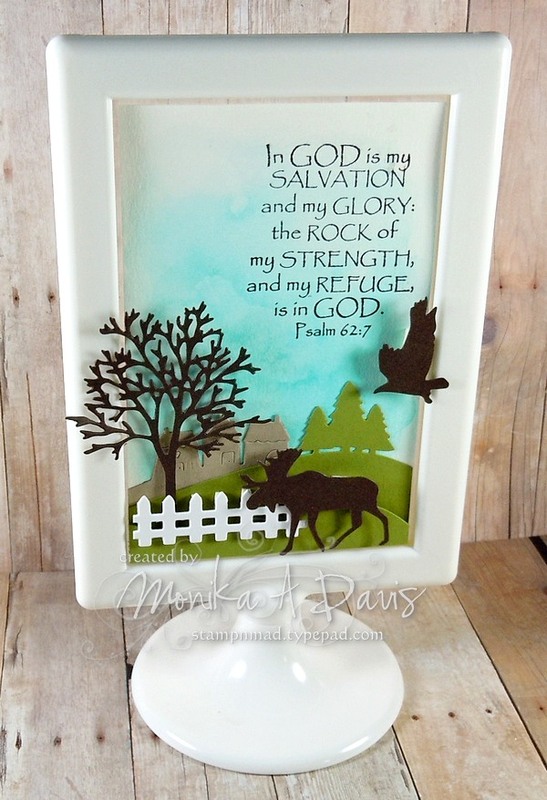 I kept this CAS to showcase the bold letters and fun silhouette. Hello! 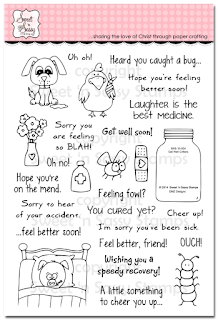 It's Monika here today, with a get well card. 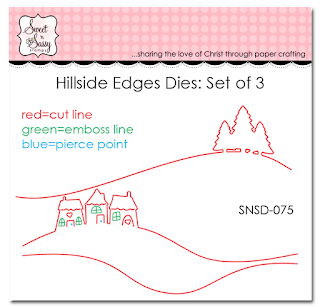 While I did not use the coordinating die set (Get Well Critters Die set), I used some of my favorite dies to make the scene. It might seem familiar, since I used these dies before... remember? 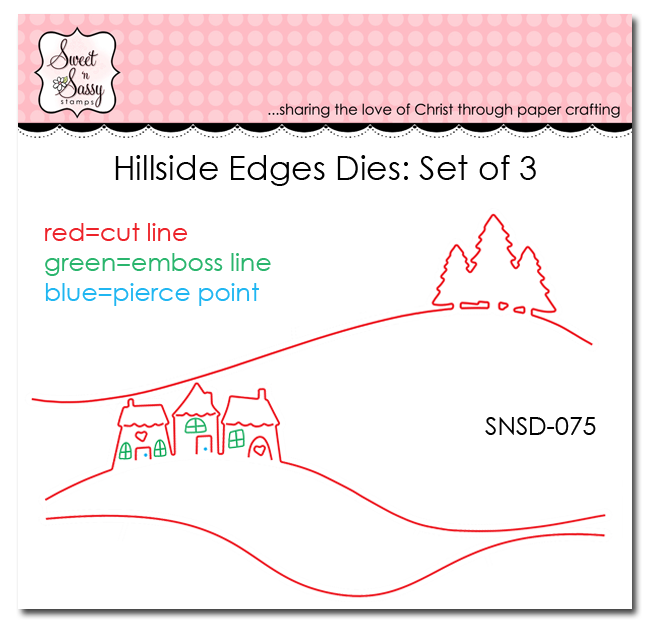 To build the fun scene, I used Hillside Edges, Bare Tree, Happy Happy, and Fence & Grass (currently unavailable) Die sets. 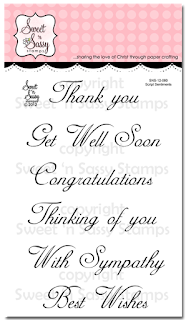 For the greeting, I used Get Well Innies clear stamp set. 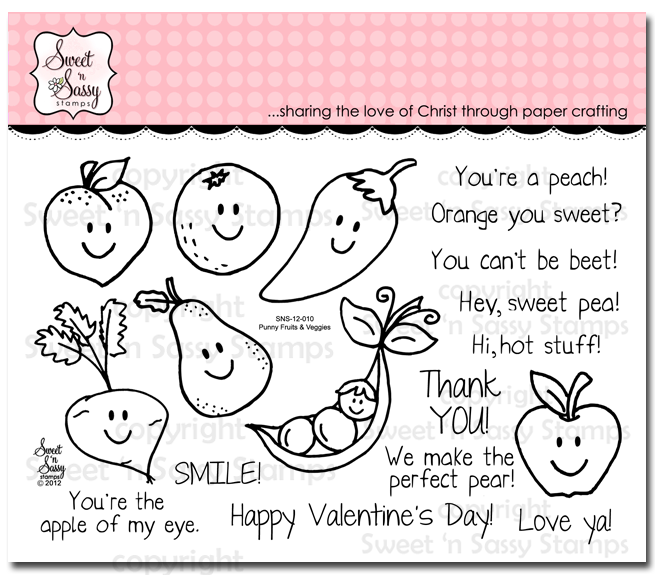 It's Susie here to share a card using the Punny Fruits and Vegies clear stamp set. 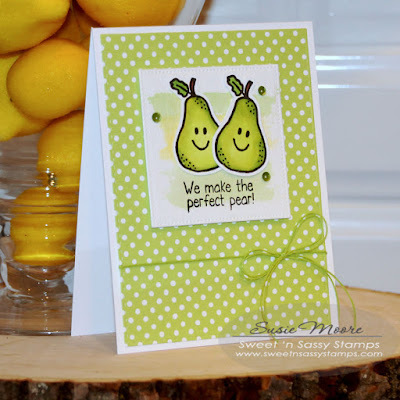 I decided to use the pears which I cut with my Silhouette Cameo. Then I colored them with Copic markers and adhered them to a small water colored background. Here is a look at the stamp set I used. 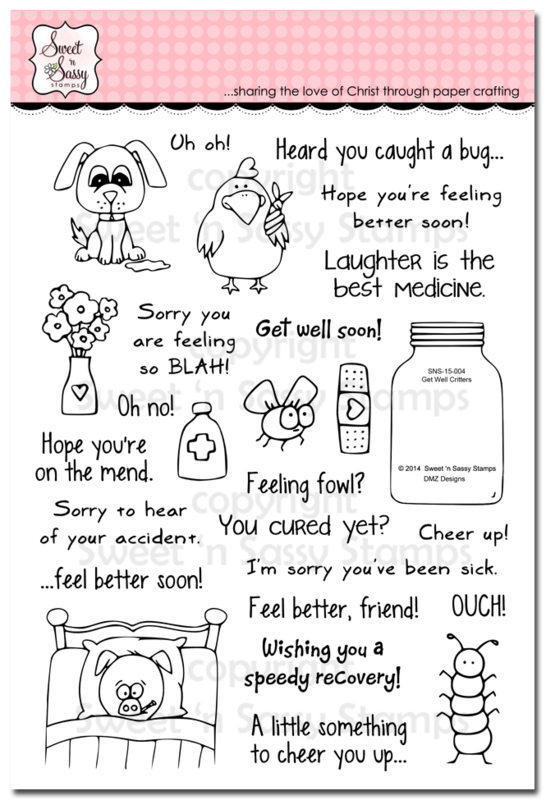 Take a look at how many clever images and sentiments are included. I can't wait to use this set again! Hello Sweet Friends! Julie here to share a fairly quick floral card using Mini Flower Blocks 3, Shining Light and Typewriter Text Background from Sweet 'n Sassy Stamps. 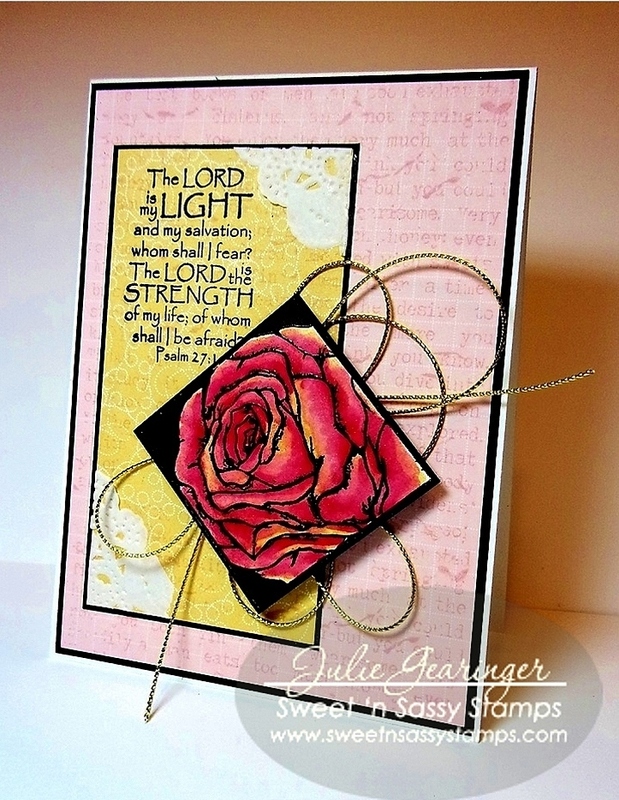 I heat embossed the rose image from Mini Flower Blocks 3 using black embossing powder and water-colored the image with markers before adding Clear Wink of Stella® over the petals. 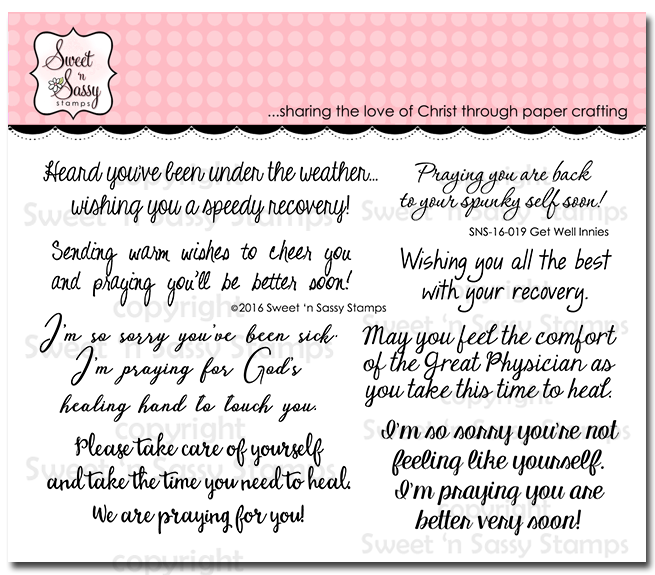 Using a light pink ink, I stamped the Typewriter Text Background onto a piece of yellow and light pink designer paper before stamping the sentiment from Shining Light with an archival black ink ( I love the subtle background that the Typewriter Text Background creates :-)). I mounted the panels onto black cardstock, added pieces of a white paper doily to the corners of the yellow layer before mounting the panels to the white card base. 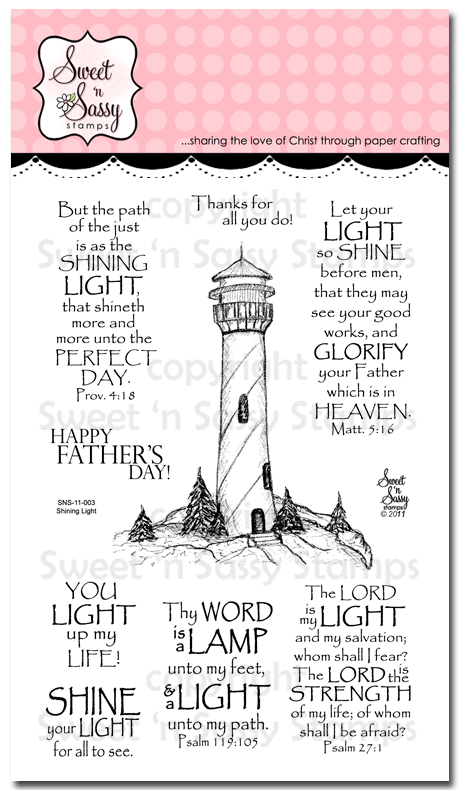 I had a great time creating this quick card and I think that the verses in Shining Light are perfect for an encouragement card as well as Father's Day! 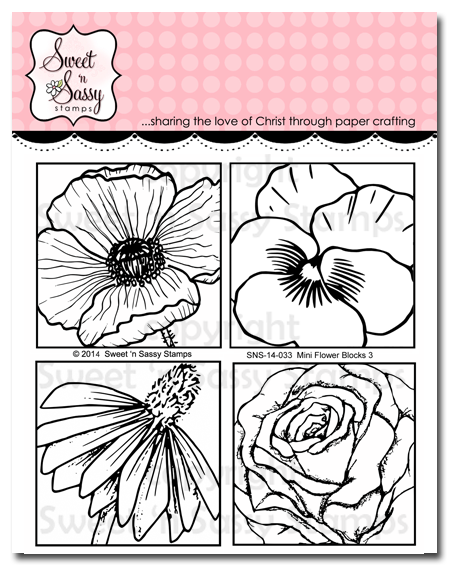 Add the Shining Light verses with the gorgeous floral images in Mini Flower Blocks 3 and not only are you able to create a multitude of cards but they are also fabulous for Creative Worship (Bible Art Journaling)! 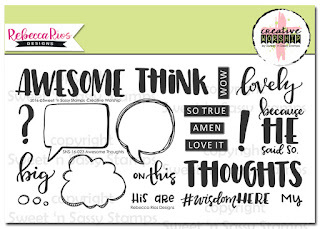 I hope I have inspired you to break out your stamps and get “inky”- have a blessed week, sweet friends! Happy Saturday, Sweet 'n Sassy friends! it would make a great page title for a scrapbook page. I used it for cardmaking and zentangled the letters. 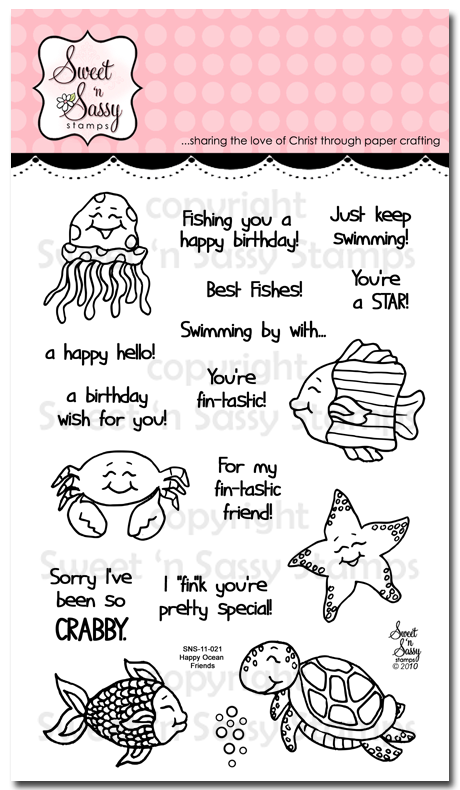 You could also use it to make notecards with the recipients name zentangled on each one, how cute would that be!?! 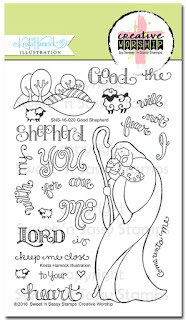 Or zentangle their name on a 5x7 piece of cardstock and frame it for a baby's room, so many possibilities for this set. If your not a zentangler, you can just color them in for a cute name frame. It's definitely a must have for the crafter, whether you are a card maker, scrapbooker or bible journaler. To make my card, I used a white panel of Bristol paper. 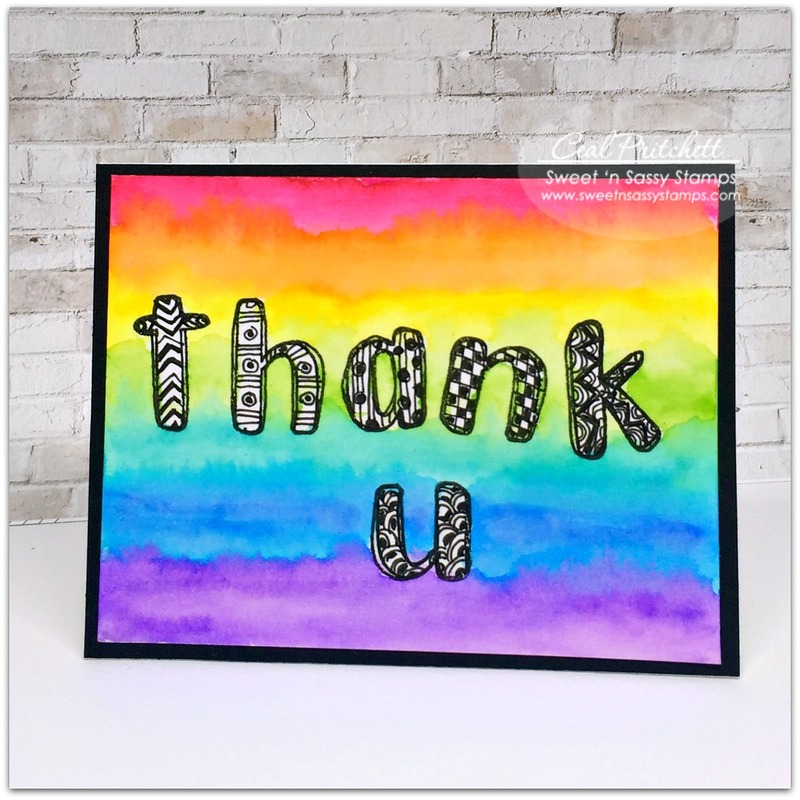 I stamped the letters with VersaFine Black Onyx ink and the zentangled in each letter with a project life pen. To make my background, I took Zig clean Color markers and drew a line across the paper in ROYGBIV order and then blended them with water. Here is the set I used as you can see it has quite the possibilities! 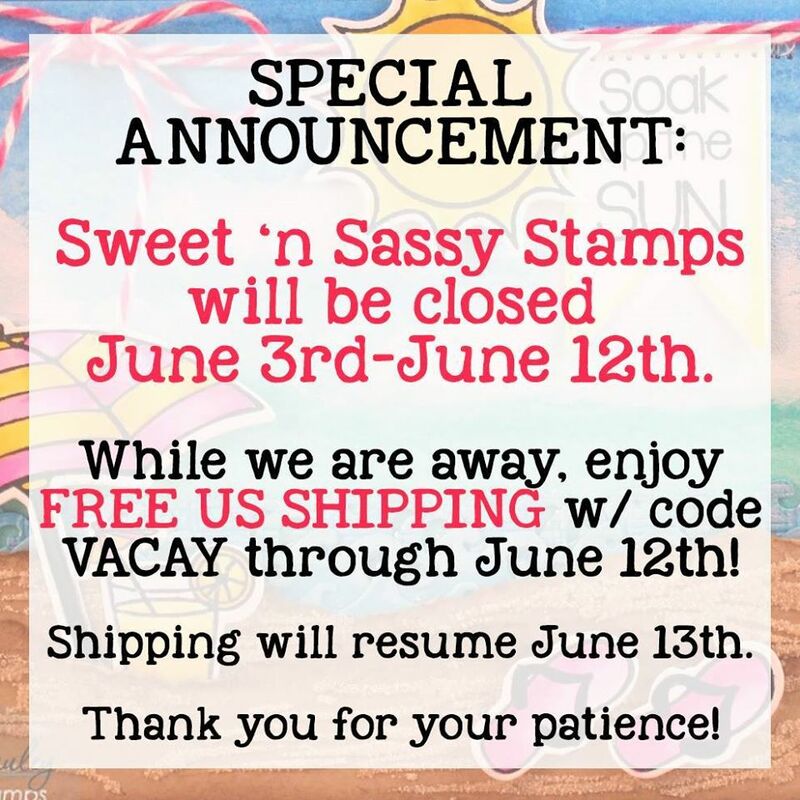 Don't forget Korin is on vacation and is offering free shipping thru June 12th!